Symantec provide overview and analysis of the year in global threat activity via its Internet Security Threat Report (ISTR), with a exclusive details that 400 million new variants of malware were created in 2011, which is an average of 33 million new variants of malware a month, or an average of one million new variants a day. The report is based on data from the Global Intelligence Network, which Symantec's analysts use to identify, analyze, and provide commentary on emerging trends in attacks, malicious code activity, phishing, and spam. 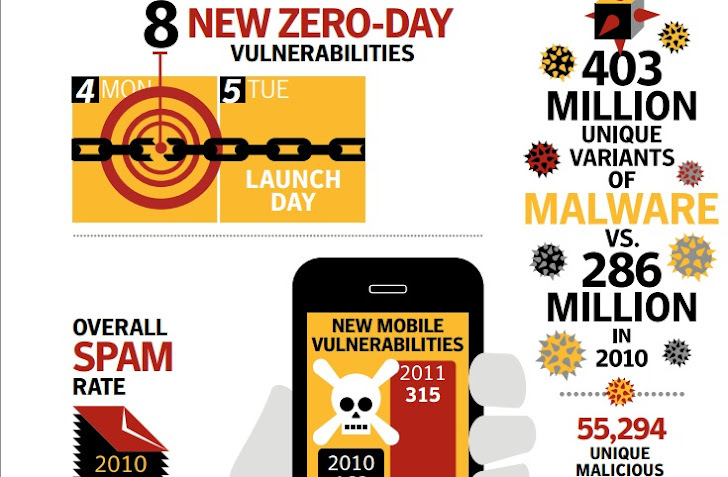 Here are some highlights from the threat landscape of 2011. "It is impossible to manually analyze such a large number of sample files, so it is therefore necessary to use an automated threat analysis system to analyze sample behavior and prioritize the files that virus definitions should be created for." Symantec said in a blog post. Political activism and hacking were two big themes in 2011 themes that are continuing into 2012. There were many attacks last year that received lots of media attention. Hacking can undermine institutional confidence in a company, and loss of personal data can result in damage to an organization’s reputation. Also, Many companies are keen to adopt cloud computing. It can reduce costs by outsourcing routine services. The first risk is unmanaged employee use of cloud services. The proportion of phishing emails varied considerably by company size with the smallest and largest companies attracting the most, but the proportion of spam was almost identical for all sizes of business. The United States was the number one source of all activities, except for malicious code and spam zombies, where India took first place. Around 12.6% of bot activity originated in the USA as did 33.5% of web-based attacks, 16.7 % of network attacks and 48.5% of phishing websites.